Aubrey Lewis was born January 1, 1935 in Glen Ridge and grew up in Montclair. A fast and powerful all-around athlete, he excelled in football, basketball and track as a teenager. Aubrey was born with a heart murmur, which might have precluded him from playing high school and college sports. But whenever he took a physical, he told the doctor he had just run there from class, and they dismissed the rapid beating of his heart. At Montclair High School, Aubrey was a champion hurdler and set state records as a sprinter in the 100-yard dash, 220 and discus. 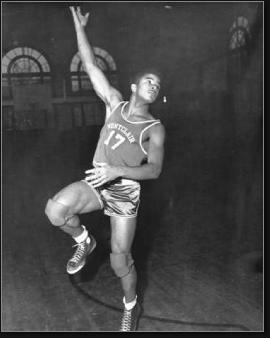 He was also the power forward on Butch Fortunato’s unbeaten basketball squad in 1953–54. But it was as a football player that he first gained national acclaim. Aubrey ran for more than 4,000 yards and scored 49 touchdowns for the Mounties, who won a pair of state titles while he played for the varsity. After sorting through scholarship offers from dozens of top colleges, Aubrey enrolled at Notre Dame in 1954. He starred for the football and track teams, winning the NCAA title in the 400-meter hurdles in world-record time as a sophomore in 1956. Aubrey attempted to make the Olympic team in this event and was leading the race when he clipped the last hurdle and did not finish. He also fell short in the decathlon trials, finishing 8th. In 1954, he had been runner-up in the AAU decathlon. In 1957, he was named captain of the track squad, becoming the first African American to captain a Notre Dame sports team. Aubrey was a backfield mate of Paul Hornung’s on Terry Brennan’s Fighting Irish teams of 1955 and 1956. He was the starting halfback behind Horning in ’56 when he won the Heisman Trophy. Aubrey was slated to be Notre Dame’s featured runner in 1957, but an ankle injury limited him to 11 rushing attempts. The Chicago Bears selected Aubrey in the 10th round of the NFL draft. His ankle had not fully healed and he did not make the club. He decided to go into teaching, working in Newark, Montclair and in the early 1960s Paterson, where he coached the Paterson High football and track teams. In 1962, Aubrey was recruited as part of the first class of FBI agents that included African Americans. He served in the bureau for five years before taking a job as an executive with F.W. Woolworth. Aubrey also served on the New Jersey Highway Authority and the Port Authority. The Newark Star-Ledger named him New Jersey’s Offensive Football Player of the Century. He was much in demand as a speaker at corporate events. Aubrey passed away at age 66. The heart problem that had plagued him since childhood finally caught up with him. One of Aubrey’s sons, Aubrey Jr., coached football and track at Montclair State. His grandson, Aubrey III, was an all-state running back at Montclair High.